A project to expand the National Science Foundation's famed Very Large Array (VLA) radio telescope, improving its scientific capabilities tenfold, has received strong endorsement from a prestigous national panel of astronomers given the task of setting priorities for astronomical projects in the next decade. The Astronomy and Astrophysics Survey Committee, established by the National Research Council, the working arm of the National Academy of Sciences, gave the VLA Expansion one of the top ratings among proposed ground-based observatory projects in a report issued today. "This ranking by the Survey Committee, which heard from hundreds of astronomers around the country, shows that the astronomical community places great importance on expanding the VLA," said Paul Vanden Bout, Director of the National Radio Astronomy Observatory (NRAO). "The VLA is a unique and critical resource for the world's astronomers, and the VLA Expansion Project will ensure that scientists have a state-of-the-art tool to meet the astronomical research challenges of the 21st Century," Vanden Bout added. "These improvements will increase the capability of the VLA tenfold in all scientific aspects," said Rick Perley, NRAO's project scientist for the VLA Expansion Project. "This tremendous increase in capability will cost the NSF about $140 million, far less than the present value of the VLA. In addition, the operational costs remain about the same and the maintenance costs may even fall because of the increased reliability of newer equipment," Perley added. The VLA Expansion Project is a two-phase program, with the detailed plans for the first phase already submitted to the NSF. The first phase will cost a total of $76.2 million, $49.9 million of which is requested from the NSF. "We already have a committment of $2 million from Mexico and are negotiating with Canada for key technical equipment worth $10 million," Perley said. Dedicated in 1980, the VLA is the most powerful, flexible and widely- used radio telescope in the world. It brought dramatically-improved observational capabilities to the scientific community in 1980, and has contributed significantly to nearly every branch of astronomy. More than 2,200 scientists have used the VLA for more than 10,000 separate observing projects. Astronomers seek more than twice as much VLA observing time than can be provided. For example. in 1977, when the partially-completed VLA began making routine scientific observations, Seymour Cray unveiled the CRAY-1 supercomputer, then the most powerful computer in the world. "Cray's first machine had a clock speed of 80 MHz, and today we are throwing away PCs with processors that slow," said Perley. "By bringing all the VLA's electronics up to today's state of the art, using modern fiber-optic data transmission techniques, and adding new antennas, we get an essentially new astronomical instrument with vastly increased capabilities at a fraction of the cost of starting from scratch," Perley said. Better images of cosmic "nurseries" where new stars are being formed and disks of gas and dust surrounding those new stars are forming into systems of planets. "These regions are obscured by gas and dust from view by optical telescopes. The EVLA will be a prime tool for understanding the processes ongoing in these regions," Perley said. Ability to gain important new information about the atmospheres of other stars, their life cycles, and how processes on other stars relate to processes on our own Sun, which also can be studied much more effectively with the Expanded VLA. The report issued today is the fifth such report outlining priorities for astronomical initiatives for an upcoming decade. The first such "decadal review" panel issued its report in 1960, setting priorities for the decade of the 1960s. Subsequent reports established priorities for the 1970s, 1980s and the 1990s, the latter report issued in 1991. The Astronomy and Astrophysics Survey Committee was co-chaired by Christopher McKee of the University of California at Berkeley and 1993 Nobel laureate Joseph Taylor of Princeton University. There were 13 other members from institutions throughout the U.S. The 1971 panel report, issued by a committee led by Jesse L. Greenstein of Caltech, listed building the original VLA as a project "of the very highest urgency and priority." That same year, the NSF submitted the VLA project to Congress, which authorized building the VLA in 1972. 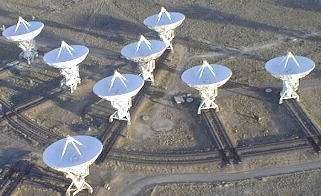 The 1991 panel urged funding for an "extension" of the VLA to improve the quality and detail of VLA images.